Lawn care maintenance is one of the lesser considered but no less important parts of making your home or business look its best in the neighborhood. 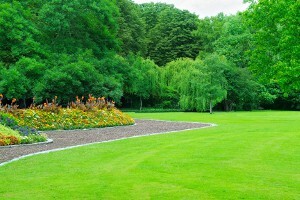 The following are many ways that outsourcing your Racine landscaping services can benefit your home and business. Your time is very valuable, and often you have better things to do than landscaping services. Is mowing and maintaining the lawn really the most effective use of your time? If the answer to this question is no, perhaps it is time to outsource. Through this kind of outsourcing you can save yourself time to do more constructive and enjoyable things that will make your life better, and leave the basic work to other people. Your property looks its best when the lawn is well tended and the area is cleaned up. Unless you have the time and the inclination to do this yourself, your property may fall into disrepair. When your property looks good, people will feel better in the area. Even you may find that your temperament is affected by the general appearance of your property. When you want to feel your best, make sure your Racine landscaping services are handled on a consistent basis. Proper maintenance of the land around your home or business shows that you care about your area. When you care about where you are, it tends to inspire other people to also care. This can actually increase the value of your property and lead to increased local prosperity. While you can’t make a bad area good just by having a well maintained property, a good area can certainly get better when your property is well maintained. One caveat to hiring a Racine landscaping company is that they need to be properly insured. Hiring “somebody” has the tendency to come back to haunt you if they aren’t insured and either something ends up getting damaged or someone gets hurt. Checking to see if your lawn care company has insurance is a valuable step in knowing that they’re legitimate professionals with a vested interest in continuing their operation for a long time to come. A good lawn care service can make a significant difference in both your life and the general area where you live or work. When you’re ready to work with a lawn care company that will make your life easier, call us at 262-878-1660. If you are looking for reliable Racine landscaping services, then please call CJS Lawn & Landscaping at 262-878-1660 or complete our online request form.